‘Climate culture’ versus ‘knowing disbelief’ | Climate Etc. Climate culture versus knowing disbelief. For some time before the above post was published (Jan 30th), I’d been looking out for a particular kind of survey that ought to provide significant evidence supporting either one or other of the above analyses. Unfortunately there seemed to be no such survey measuring the group I was interested in, so I had to run without this. However I noticed in June that a Gallup poll (G1) had appeared at the end of March, which while not ideal does measure a superset grouping in an appropriate enough manner to provide useful insight. This new poll data matches closely what the ‘climate culture’ hypothesis expects, and I believe it strongly challenges the ‘knowing disbelief’ hypothesis. While G1 covers respondents from the full US political spectrum, the most insightful data comes from the Independents. The next section is thus helpful context for understanding this data. (Note: for new readers wanting a short-cut, or prior readers wanting a refresher, there’s a compressed summary of Kahan’s theory versus mine in the ~700 word Appendix). The first task is to register this data against what we’ve seen before, given that ‘what is said in the news’ about global warming is rather fuzzy, as are other terms. For instance opting for ‘exaggerated’ doesn’t necessarily mean a disbelief in MMGW, although likely means a disbelief in calamitous narrative. And having some college education is a superset characteristic that won’t always mean being science aware. However we are chiefly looking for polarization here, which distances us rather from absolute meanings, and both the Republican and Democrat responses show a strong correspondence to previous findings; the enhanced polarization that Kahan reports for the science aware is clearly reflected for the higher educated, albeit not quite to the same extreme. More education for the Republicans leads to more skepticism, more education for Democrats leads to more belief in MMGW and more belief in dangerous scenarios, in this case a belief that (on average) the news underestimates the seriousness. So far so good, this is what both Kahan’s model and mine expects. And performing a common sense comparison of the RH column, ‘generally underestimated’, with those who place global warming as a top priority (by political stripe) in this Pew survey cited in the previous post, yields a pretty fair fit that helps orientate us in belief space. (RH column average after rough college attendance profile per wiki ~ R17, I31, D45, Pew ~ R14, I27, D42). Hence we can go on to examine the responses of the Independents with relative confidence, including the attitudes of higher educated Independents, which is the element that I couldn’t find before. The attitudes of the Independents also change significantly with education. Overall the effects move in the same direction as for the Republicans, i.e. those with more than high school education are more skeptical. On average 23% more in the ‘exaggerated’ column, and 16% less in the ‘underestimated’ column. I think this modest yet clear movement is a major challenge for the theory of ‘knowing disbelief’, which theory (see the previous post or the Appendix) hinges upon powerful identity defense to explain the very same movement for the Rep/Cons, i.e. a tribal allegiance to the Republican party and conservative principles. But from section 2 we see that these individuals are more flexible or split on principles, and that partisan politics (from Republicans and from Democrats) does not turn them on. They do not actually have a Republican identity to defend! I can only assume what Kahan would predict for higher educated Independents. Given that they’re the least partisan of all voters and so the least blinded by party loyalty, one would think that their education would guide them more towards the truth. But they certainly do not move towards the ‘truth’ that Kahan has pinned the pole of the science aware Dem/Libs to. They move towards skepticism, i.e. in the opposite direction. What does the theory of climate culture predict? Given the symmetry of the Independents as noted in section 2, a plausible start is to assume this same symmetry on the particular issue of climate change. I.e. the Independents are formed from two approximately equal populations, one adopting similar attitudes to the Democrats and the other adopting similar attitudes to the Republicans (assuming that on average the ‘centrists’ fall 50:50). So the ‘High school or less’ row for instance, should be about an average of the Dem and Rep rows for this same category, which comes out at GE42, GC23, and GU32. That’s pretty close, it seems a reasonable assumption. But the key test for ‘climate culture’ is a prediction that higher educated Independents will be led into a path of either climate orthodox comprehension or skeptic comprehension depending upon their initial leaning, in exactly the same manner (so the same strength / proportion of attitudes) as for the Reps and Dems. Hence the same simple average should hold for the higher educated Independents too. For instance in the graduate category, this yields GE45, GC25, GU30, once again a good match. Now this result may seem intuitive to some readers, perhaps even blindingly obvious. Yet if one follows Kahan’s ‘knowing disbelief’ theory it should be completely counter-intuitive. For a survey like this with a centre position, in the absence of both higher education (including science literacy) and any strong party loyalty, there ought to be clustering within that centre, because in Kahan’s model there is no other strong influence here that would cause polarization or indeed any main departure from a centrist view. Yet the centre is lowest in all of the Independent rows; these shallow ‘V’ shapes should be inverted, which would completely break my match of Independents with simple Rep/Dem averages. And where there is higher education in this non-partisan population, as noted above Kahan’s model would surely predict a strong movement towards climate orthodoxy. (Note: the only way Kahan could similarly claim a blended effect from two populations is if each were as just as powerfully partisan as the Reps and Dems, yet we know this is not at all the case. In my own model the combined effect is via biased assimilation from a modest starting stance, with one population led much more into climate culture, the other led away). This data from the Independents adds to the evidence that attitudes on climate change in the US are not primarily a simple reflection of partisan Republican or Democrat identity. (Note: the text with the G1 poll itself does not concentrate on the Independents. While correctly noting that education for the Republicans ‘leads them in a different direction’ to Democrats, it incorrectly draws the conclusion that the dominant effect overall must therefore be ‘partisanship’). JC note: As with all guest posts, please keep your comments civil and on topic. Thank you for this offering. As a self described ‘independent’ when reading this I worry about my own confirmational bias when seeing the term “fuzzy” applied as that’s pretty much my take in the entire conversation. Understanding that this is not (yet?) a comprehensive undertaking just wondering if you’ve attempted similar evaluation of other areas of the globe? Case study: I’m ex GOP, but I voted democrat for the first time in 2000. Mostly because I don’t like presidential relatives running for office, and because Bush was giving me pretty bad vibes. I ran into the global warming issue working on arctic projects, the data showed ice cover and thickness reductions, so it was easy for me to go along with the global warming mainstream. Later I started noticing exaggerations and distortions on the part of the media, so I started looking at data and I became convinced the problem was overstated and the proposed solutions were pretty useless. I also find the politics are much more polarized in the anglosphere, and Europeans have a tendency to discuss this issue once in a blue moon. What about distortions in papers and by researches themselves (in media, if not papers)? I feel that I often read strange alarming speculation with little caveat and ignorance of equally/more-likely beneficial outcomes in actual papers or from researchers in press. Also, quickness to provide the flimsiest of caveats to benefits. Basically, I often see language that has no business in a technical papers and neglect of what should be should be even more obvious and likely alternate possibilities when conclusions are presented. The problem with other countries is that there seems to be far fewer polls and also they are typically less segmented. 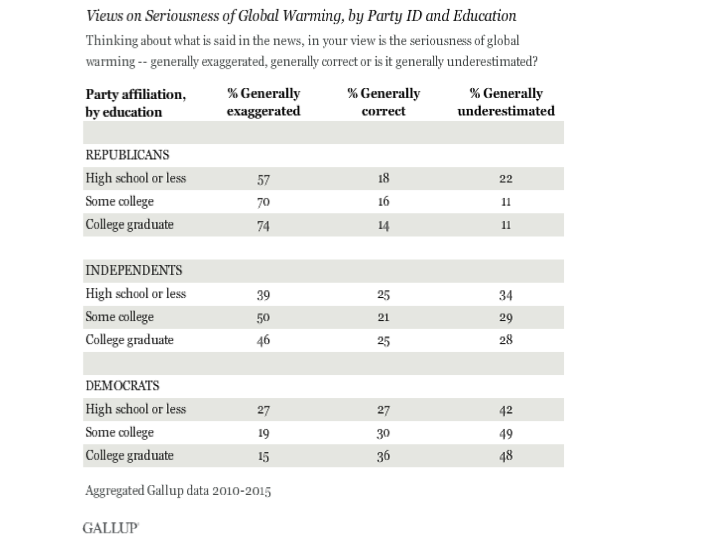 Even in the US, some segments very rarely feature (the intersect of higher educated Independents with climate change attitudes being a case in point). With less material and lesser resolution to work with, it’s harder to see what is happening elsewhere, although I’ve not had a serious attempt yet. I’d presumed this to be the case based on the difficulty obtaining satisfactory sources for the U.S., but figured it wouldn’t hurt to ask. Will look forward to others located elsewhere chiming in hoping for appropriate self filtering. Thank you again for this contribution! 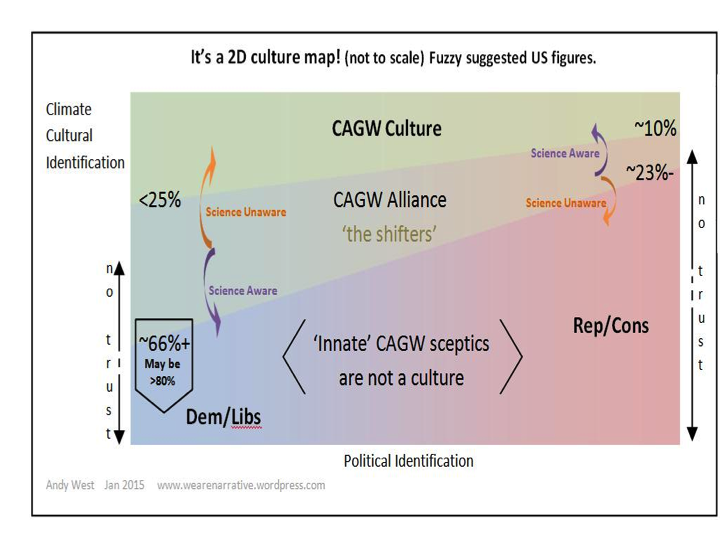 The large gap of resistance to narrative of CAGW by college educated (=science aware?) Rep/Cons and Dem/Lib (74% vs 15%) is just confirming the usual political differences between these groups. No surprise. Independents (= not republican AND not democrat) seem to be positioned “in between”, which is also not very surprising. Probably the ‘climate culture’ addressed in this post is nothing else than ‘political preferences’, and has neither much to do with climate, nor with culture. What would seem to bear further investigation is the definition of “educated” in the examination of opinion differences on the CAGW issue. It is possible today to define as “college educated” people who have gotten their undergraduate degrees by way of curricula utterly bereft of the “hard” sciences (physics, chemistry, biology) and without either formal training in scientific method or in critical thinking by way of the evidence-based evaluation of assertions ostensibly supported by research. There is good cause to speculate that those “college educated” “Dem/Lib” persons considered in this article are not so educated. The supposition more than sufficiently bears focus thereupon. Or would that be “racist”? The college idealists who fill the ranks of the environmental movement seem willing to do absolutely anything to save the biosphere, except take science courses and learn something about it. Illiteracy is unacceptable but innumeracy is ok. Imagine if we flipped the tables and required all college graduates to pass calculus, probability, and statistics – that would trim the ranks. Imagine if we flipped the tables and required all college graduates to pass calculus, probability, and statistics…..
As an undergraduate Biology major many decades ago, I was required to take a two-semester course in the calculus, but not statistical analysis. At the time, I wondered just what the hell in the discipline of biology I would need the calculus of infinitesimals to address, and I was pretty much convinced that the only purpose for its inclusion in the department’s curriculum was to make getting that degree as grinding a motherhumper as possible (thereby proving to all and sundry that the matriculant who got through that gymkhana was a thoroughly whipped dog who could be made to swallow anything, no matter how arbitrary and useless). Statistics I had to pick up na levo, pretty much “on the fly” in my professional activities, particularly as I was required to address participant pushback while structuring educational activities and editorial critique in publishing both review papers and reports of clinical research. The Accounting majors got StatAn. Those of us with our clothes reeking of formaldehyde and our shoes colorfully spotted with hematoxylin and eosin didn’t. Kahan’ knowing disbelief model is logically flawed. If one knows that the pause falsifies model predictions according to Santer’s criterion, that observed effective sensitivity is between 1.6 and 1.7, not modeled 3.2, that SLR is not accelerating, Artic ice has not disappeared and looks to be once gain increasing, polar bears are thriving, extreme weather is not increasing, UK kids are very familiar with snow… Then the only rational position is to knowingly disbelieve all the CAGW pronouncements and propaganda. The ‘truly informed on climate’ dimension is missing, as you point out. Maybe Dr. Joseph Goebbels was a great psychologist. Kahan is a great case in support of his hypothesis. Source? It’s seems this is how it’s framed but is that how it truly is? Honest question, not intended as sarcastic. I’ve not seen an evaluation of this and would be interested. Tear has posed an interesting question. I found this in the houses of parliament library. It lists the social and educational backgrounds of all MP’s in the 2010 general election intake. This was especially interesting as this contained the first Coalition for many years. Labour MP’s would closely correlate to democrats although their left wing would likely be more left wing. Conservatives would roughly equate to republicans but your right wing would be much more right wing than ours. Libdems would aso roughly equate to democrats. In effect are the conservative elements more conversant with the hard sciences than those with more socialist tendencies? Unfortunately it appears the answer to our questions does not lie within that report. It skirts around but does not specify science/non science backgrounds. I’m likely for the near term to take the lazy way out on this one and see if anyone following has a source they’re aware of as I’ve not been able to locate one quickly and my time is not as free as it was earlier in the year (sigh). But I think I’ll keep this one handy for future follow up as it’s an intriguing question that at least the 3 of us might find of further interest. I thank you for the resource. Still following the discussion but trying to follow more Mosh’s advice of reading more……………but I still have a habit of asking questions. I don’t have a source; this was just a thought coming up as I read Judith Curry’s post, combined with my convolution of climate articles and comments over the past years. Thanks Tera~! You sure spurred along my interest as I think it’s a great question and hope to find some time in the near future to look in to it. A slight majority are from the conservative party but that might be expected as they are the overall largest party. Higher educated Democrats would be the greenies and the more affluent. Working middle class and working class Dems are more practical. Many of them have some common sense. I think we need a large grant in order to carry out this ground breaking work.We could get prof lewandowsky in to add the project some gravitas. Unfortunately b comes before m for montford and t for Thomas so looks like it will be known as brown et al and I will get to appear on all the talk shows promoting the significance of what we have found. Exciting times. As long as I get paid, Tony. What? Only you get paid? Willing to let some pennies slip through to those of us alphabetically (if not otherwise) impaired? Sorry, Danny. I was only thinking of myself. Big Oil hasn’t sent me my check for months and I need funds. Yep. Times are tough in the oil patch right now. Keep those of us alphabetically challenged in mind. It’s all about the little people ya know. Maybe Tony (capitol) ‘B’ will think about us too! It’s a tough world out there. I am thinking of changing my name to Abbott to make sure I stay right at the top of the pecking order as regards the lead author on ground breaking papers. My money comes from big wind. . Big oil is so yesterday. Knowing disbelief is standard progressive politics today. Educated lefties will tell pollsters whatever the party line requires, but they don’t really believe the talking points. Global warming isn’t any different than any other talking point. No one with a brain believed all the stupid promises made about Obamacare that have been exposed now and no one believes that 1 in 4 women on campus is sexually assaulted. No one believes that women are denied access to birth control (otherwise the Democrats would identify someone) or that they are paid less for the same work. No one believes that voter IDs are too complicated to obtain or that vote fraud doesn’t exist. No one really believes the silly claim that the demand for unskilled labor goes UP when minimum wages are raised. No one believes Obama’s ridiculous claims about his ‘carbon plan’, his Iran deal, his Benghazi youtube explanation, or his claims that the IRS didn’t target his opponents. Just as no one believed any of Hillary’s lies about her emails when she first made them. Seriously, can anyone claim they are shocked, shocked to learn that everything she said turned out to be a lie. Of course, not. When asked by a pollster, every good loyal soldier of the Left will say they believe anything their leaders claim. That’s how they play the game. They don’t really believe any of it. Not those with a brain. That would be stupid. But they know that the lies help get fools and low information voters to vote, and that helps the party’s hold on power. So they do their part for their cause. The polls won’t tell you what they really think. Which brings us to global warming. I’ve had numerous discussions with standard issue lefties who spew talking points until it becomes obvious that I’m far more educated on the issues than they. At that point, it is remarkable how many come back with a version of “It really doesn’t matter if global warming is real. I support all the political goals of the environmentalists to shut down coal and regulate evil corporate interests, blah, blah, blah.” Global warming is just the excuse. If global cooling were the excuse, they would say they believe in global cooling. All that matters to them is being a team player and supporting the cause. Don’t put too much stock in poll numbers about what people supposedly believe. Not if the question relates to a political talking point. Knowing disbelief is an epidemic. For the record on political bias, I was a long-time UK Labour/ALP supporter, I stopped voting Labor at national level when Keating became PM in 1991 (having often sat across the Cabinet table from him, I didn’t think that he was fit to be PM, and I think that the ALP and its policies have gone downhill since his first challenge to Hawke), and at the Queensland level shortly after the abominable Beattie was elected in 1998. I”ve generally voted Liberal/Coalition since then, but frequently criticise them in the media. I can’t see that I’d ever vote ALP again, they’ve gone to the dogs. My bias is towards honesty, integrity and soundly-based public interest policy. Not much of that evident in response to alleged CAGW. I agree with you. It is a mistake to weigh a persons political loyalty as similar to team loyalty. A loyal fan of the Wolverine football team uses a different thought process than a person who consistently votes for, or almost always votes for, one party over the other. IMO, voters will think it through, at least somewhat, whereas with football fans it is all emotional. Would like to hear your opinion on how and why U.S. opinion polls are so confusing and downright contradictory on climate change, power plant regulation, and renewable energy. (2) (3) Most Americans don’t believe in MMGW or that a scientific consensus exists. (6) Everybody loves Renewable Energy. (7) Everybody loves limiting carbon emissions. Hope people responding to this will be consistent in their answers. Opinion polls are confusing on can be contradictory on many subjects. Nothing special about climate. Wording makes a good choice and people always like to have socially acceptable answers. The findings don’t follow the narratives some employ -but I don’t see any more contradiction than you see with polls in most any other area. Guess I’m closer to the American mainstream than I thought. It’s a distant risk/problem, that will probably be solved by technology. Let’s help technology, but let’s not raise energy prices. Really, it does make sense. It’s intuitively obvious to everybody but economists that changes to energy prices are multiplied in their effect on the economy. People see trucks all over the road. You think they don’t realize everything they buy will be more expensive if those trucks have to spend more on fuel to deliver it? They may not be able to verbalize it, but they see it. Only the economists are clueless. Stephen – electricity price correlate positively with the quantity of renewable energy. Screw the polls, just look at the facts. Planning Engineer makes good points. How the questions are phrased, what groupings they are in, and whether or not they invoke identity issues, all make huge differences. Nor are many folks knowledgeable about what they are being asked, which contributes to apparent contradictions. So looking at domain knowledgeable and non-domain knowledgeable responses is good to do, if data is available. And look at surveys / analysis from different sources. As planning engineer notes, there is less contradiction here than the headlines imply, but the Yale Project on Climate Communications at your link, of which Kahan is a part, have their own very strong (and climate orthodox) framing. Sometimes, claiming for instance that beneath all this confusion ‘must’ be a deep-seated fear and desire to act (or repression of such for Rep/Cons), is easier and more aligned to motives, than actually drilling down in the data to find out what is truly happening. Per my previous post on this topic linked above, Kahan does indeed claim the fear and repression via his ‘knowing disbelief’. The folks who are only in alliance with climate culture but not full adherents, per the diagram in the head post above, will create inconsistencies of the type that you’re asking about. For instance asked whether they believe in dangerous MMGW, they will say ‘yes’. But they never place this apparent ultimate problem high on any list of priorities to be addressed. This is a contradiction caused by identity issues, and occurs much more for the Dem/Libs than the Rep/Cons. Yes. Dem / Libs also score CC low or very low on these kind of polls. This is because, unlike a direct question such as: ‘do you believe in dangerous MMGW?’, which invokes their loyalty to party and principles, i.e. a part of their identity, a list allows them to express their real (and much lower) commitment, without betrayal of identity. Those Dem/Libs who respond in this manner are the ‘shifters’ in the diagram in the head post. There are more of them than the Dem/Libs truly committed to climate culture; in some surveys, twice as many. They are confusing to you because you expect them to be to consistent but they are not. Most people are innumerate and all people are predictably irrational, as described by Kahneman, Tversky, Ariely etc. Here’s a little something from a professor of statistics at U. Of Delaware. It is interesting to note that a significant number of skeptics are retired engineers and other stemsters – they know FUD, BS, and blowhardism ™ when they see it. Interesting. Have lately come to conclude the same; that all people are irrational. Did so though purely by osmosis; no reading about it. Pleased to hear that some intellectuals confirm it. Everybody loves clean air and water. Also free stuff. And cute puppies. Everyone is against waste, fraud and abuse. And war. Strangely, a lot of people who say they like cute puppies and free stuff won’t accept a gift of one, not even for free. Because even stupid people understand that they aren’t really free and the stuff in the house won’t stay clean. Too bad about that — no such thing as a free lunch — reality. If poll questions do not present the real trade-offs (and accurately), they are worthless. I’m in favor of cleaner air and water. I’m in favor of better education for kids. [and living year round in luxurious vacation resorts] But I’m not in favor of paying vast sums we don’t have for improvements that are so small they can’t be measured. I have a bit of a problem with “it doesn’t seem plausible that fundamentally different mechanisms are driving attitudes to climate change in the US than in the UK (or elsewhere).”. Given the huge political, ethnic and cultural differences, why isn’t it plausible? Good question. Because of the different politics / ethnicity etc.that you note, one would expect different scores in different countries for the various questions / categories, as indeed occurs. But the more basic psychological mechanisms such as emotional bias, group loyalty, reaction to anxiety memes, assimilation bias and so on, are pretty universal in humans everywhere. Hence one model should more or less work everywhere*, albeit with different shapes on the conceptual diagram that reflect the different scores (as I mention for the UK and US), but still fitting this same model. If you need a fundamentally different model for each of US / UK, you are not founded upon the true primary psychological drivers; so you are more likely to be wrong. * = within reason. The US & UK fine, indeed any modern western nation and likely most nations where climate change culture has significant penetration. But perhaps not between the US and isolated New Guinea tribesmen, say. How much influence do our educators, journalists and entertainers have on molding social acceptable views? Is their any sampling data on the views in those three groups? From my personal observation I would say all they are all generally motivated and successful evangelists for their causes. It may not be an accident that the majority of informed skeptics are senior or retired engineers, STEM majors. That’s not something I’ve looked into. But however influential they are, the results of their influence should be seen in the end product, i.e. the attitudes of citizens. *If* there is successful evangelization for a cause, this should produce cultural bias, and you would expect to see the typical signs of this in the segment of the population most influenced. Per the head post, there is a climate culture, and the Dem/Libs show by far the largest signs of bias towards this culture, both for full adherents and those ‘in alliance’. I’m not sure that being a STEM protects folks, on average, from influence by climate culture. I may not agree with Kahan’s analysis, but he’s done some great surveys to get his base data, and one of these (follow the link to my previous post above), shows that the ‘science aware’ on both sides are much more polarized on CC, as indeed mentioned in the head post. This means STEM Dem/Libs have *more* belief in dangerous MMGW, not less. This is because of assimilation bias, where a modest initial bias e.g. from party loyalty, creates a path to different knowledge bases, i.e. orthodox climate knowledge, or skeptic climate knowledge. When a culture is strong enough to derail science, there are ‘different sciences’, you might say. This same effect can be seen, to a lesser extent, with creationism and evolution. Ron, there’s a response in the pipeline for this, but I must have used a bad word and so it’ll be stuck in moderation for a while. The difference isn’t STEM training per se. It’s in real world vs. make believe, government/academia world. Engineers who have to make things work in the real world understand just how much that is published in professional journals is worthless. They know that a nice sounding theory isn’t the same thing as a workable solution. In make believe govt/ivy tower world, the purported ‘findings’ in the abstract of a study are assumed true. Liberals believe claims because some journal published them. Conservatives who have to live and work in the real world laugh and call BS. BTW — somebody called AJ Strata who apparently works with NASA once wrote a blog post some years back about the difference between scientists and engineers. He noted that reliance solely on the opinions of scientists was foolhardy — they are rewarded for dreaming up ideas even if they don’t end up working out. If you put them in charge of making rockets, a lot of people would get hit with raining rocket stuff. If you want something to work, build it with engineers. Engineers understand quality. Scientists don’t even understand the term. Climate science would improve 1000% if they let some engineers start checking the quality of scientists’ imaginings. Andy, Thanks for this post and Stanton I think you nailed it. Andy, I reckon you need your own survey, free of the usual prompts and charged terminology. It may be thought that a vaporous term like “global warming” is okay for surveying opinion because the all-but-meaningless expression now carries its own charge through long and constant conditioning. But I’d call it deliberate push-polling. Qualifying is good, but qualifying with “thinking about what is said in the news” is really inviting people not only to respect the slob terms but also the MSM that is so kind as to serve them up daily. (According to Murdoch’s leftist news.com.au in Oz, the present El Nino is now Godzilla!) If I thought about was was “said in the news” about “global warming” you’d have to wonder if I was thinking at all. One would hope that after all these years there’d be a willingness to start from a base of clear definition. Since climate can do nothing but change on a planet which can only warm when it’s not cooling, one might expect a bit better from professional “studies”. But they all like a bit of verbal fog, a few back doors. Just in case they need to shift in a hurry! Even if the clearer term or definition is a bit long and clumsy, something like “substantial and global human-caused disruption of climate principally through fossil fuel burning”, at least one is not building on fairy floss, as the likes of Kahan do all the time – and deliberately. I knowingly disbelieve when I see the word “survey” not because of how I vote or where I live or where I was educated. It’s just that I don’t like push-polls dressed up as science – and that’s mostly all you get! Yup. Why I always hang up on them, usually during dinner. Great comment. mosomoso: Excellent comment. My bet is that you would become quickly dissatisfied by most surveys that attempted to ascertain your thoughts about MMGW. They are in most instances the wrong tool for asking any meaningful questions about attitudes to and about MMGW except “do you agree with MSM presentation of information on MMGW?” A singularly uninformative direction of inquiry..
H/t Alex Selkirk, Lewandowski and Cook. According to recent independent surveys, more than 97% of discerning customers prefer New Formula Fair Trade Moxie with Organic Axolotl (over being poked in the eye with a stick). Two eyed good, one eyed lesser.. I should add the the 3% not willing to sacrifice and pay the extra for New Formula Moxie were in the bottom percentile for social conscience and empathy (another survey we did! ), voted Republican, and preferred the poke in the eye on purely economic grounds. Very short-sighted. I applaud your effort to get behind Kahan’s simplistic typology and pre-ordained diminution of those who are skeptical of many climate pronouncements. I do not believe that surveys like Pew, Gallup and Kahan’s own will actually pinpoint the cognitive processes that are going on. They simply tally the score. If I understand you correctly you want to look at the outlier groups and what leads people to conclusions beyond their knee jerk ideological commitments, i.e., Rep/Cons who believe in CAGW and Dem/Libs who do not. Me too. Your Independent Group might shed some light but I agree with others – there is simply too much noise/lack of specificity in the data for you to uncover the actual mechanisms. I spent most of my professional career designing and analyzing surveys. Most surveys that rely on Likert type scales and the type of question they require have limited if any value for answering the question that you pose. It would be, IMHO, far more scientifically productive to focus in-depth on a critical mass of outliers and simply explore how they arrive at their positions vis a vis CAGW. Such an approach of necessity would disclose the level of understanding these individuals have of current observations, scientific methods and the nature of uncertainties surrounding climate science and the tools it employs. Still I believe you are more likely to find something more interesting than Kahan, because he essentially is baking in his answers by virtue of his analytic approach and his choice of explanatory variables. Good hunting! Most surveys that rely on Likert type scales and the type of question they require have limited if any value for answering the question that [Andy West has posed]. It would be, IMHO, far more scientifically productive to focus in-depth on a critical mass of outliers and simply explore how they arrive at their positions vis a vis CAGW. Such an approach of necessity would disclose the level of understanding these individuals have of current observations, scientific methods and the nature of uncertainties surrounding climate science and the tools it employs. In other words, an appreciation of survey respondents’ personal fund of knowledge about the phenomena and the most reliable approaches to interpretations of causality and potential effects. That’s not been attempted, I suspect, because in the “squishy sciences” (emphasis on sociology and PolySci), one respondent’s opinions are considered data as valid as are the opinions of any other participant in such a survey. Discriminate qualification of something more than those respondents’ stated loyalties to factions of the big permanently incumbent Boot-On-Your-Neck Party would seem logically to incorporate assessments of those persons’ relative diligence, perspicacity, application, information, and experience (for which credentialing has long been employed as a wholly unsatisfactory substitute, failing as it does to provide due appreciation of the Semmelweis syndrome effect pervasive among those invested materially and/or psychologically in established orthodoxies). Possibly because most scholars in that discipline are not themselves entitled to hold opinions on CAGW about which anybody really ought to give a damn. The second item in the liberal creed, after self-righteousness, is unaccountability. Liberals have invented whole college majors — psychology, sociology, women’s studies — to prove that nothing is anybody’s fault. No one is fond of taking responsibility for his actions, but consider how much you’d have to hate free will to come up with a political platform that advocates killing unborn babies but not convicted murderers. A callous pragmatist might favor abortion and capital punishment. A devout Christian would sanction neither. But it takes years of therapy to arrive at the liberal view. Candice Millard’s Destiny of the Republic is a splendid story of how the refusal to accept the source of sepsis by the US medical establishment led to the death of President Garfield. Looking at both outlier groups could be revealing. I would add that the identification of the outlier groups should be sharper than simply “generally exaggerated” and “generally under-estimated”. I also suspect that multiple cognitive processes and perspectives are present. How would someone experienced in the design of surveys structure a practicable interrogation – devised to provide Lickert-scale responses which can be subjected to statistical analysis – capable of assessing the “multiple cognitive processes and perspectives” of which you speak? In continuing medical and professional education activities, it’s customary to elicit immediate feedback from participants regarding their “takeaway” on the information provided, as well as their opinions of the faculty members’ presentations, and when wearing my D.M.E. hat and responsible for such questionnaires, I’ve found that if I try to hitch too big a caboose on such a train, there’s damn-all chance of eliciting valid and therefore useful information. If the participants don’t figuratively flip us off, they surely don’t put much thought into their responses. How does one keep this kind of survey viable (in terms of dealing with respondents’ willingness to put in the time and effort to return meaningful information) while still useful in the valuation of “multiple cognitive processes and perspecties”? This is a way around what I call “the sheep dip” approach to professional training and development. Thanks Bernie. Indeed there are many complexities and difficulties in collecting good survey data, as you note. However, on the upside the characteristics of the fundamental psychological drivers, i.e. group loyalty and cultural / emotional bias, susceptibility to fear and hope memes, assimilation bias and so on, are quite well mapped and pretty much common to everyone. Hence we know there is some underlying order and (relative) simplicity. I think the chief difficulty in unmasking this underlying simplicity is not the complications of surveys, but the bias of those doing the analysis (and there is no-one, including me of course, who is completely free of bias). However, bias is domain orientated (you can be very biased in one social / intellectual domain, but not at all in others), which means there should always be some folks who can be objective about a particular domain. Kahan’s surveys are well designed and he has amassed some great data. Unfortunately, in the climate domain he believes in the full orthodox narrative of dangerous MMGW as an absolute truth, and does not take the precaution of assuming it might merely be a cultural position. This appears to blind him to what the data really says, for instance that Dem/Lib identity defense is greater in CC attitudes than Rep/Con identity defense. Per the head post, the attitudes of non-partisan Americans are helpful in unmasking the underlying model, and showing that attitudes on CC are not just a linear reflection of a position on a left / right axis (which does not reveal the very important category of the Dem/Lib ‘shifters’, for instance). The problem is that survey methods largely are prone to generating the type of constructs that you are talking about. Assume that the purpose of the survey is to determine the basis upon which people hold their current attitudes to MMGW and what it would take for them to reassess their current position. If you phrase the issue in this way, I doubt very much that Likert type items will really generate the answers that will be realistic, at least not without doing sufficient research to map the likely factors influencing the survey – and that is precisely the research that Kahan and others have not done. Let me give you an example from my own work. If we were addressing an issue of say turnover in a company, we would first design the sample to include those who had left the company and current employees in positions where turnover is very expensive. We would then pose an initial open-ended framing questions like: Think of the last time you thought about leaving Company X? In your own words please describe what led up to you thinking about leaving the company. What led you to your final decision to stay(leave) the company? These open ended questions would then be followed by closed ended questions covering issues that typically are associated with turnover decisions. Each item included a comment box that appeared whenever the individual identified an item as being of great importance and asked for more specifics. The point here is to gather grounded information to help understand the process actual people go through when making actual decisions. The purpose of the survey design is to help understand the issue by ensuring respondents are engaged in the “discussion” and provide thoughtful responses, rather than to have respondents generate information that is easy to analyze even if it has questionable validity. The result, I believe, would be a dramatically different type of data that would reveal how people come to hold and maintain their current attitudes towards MMGW. One of the great things about internet based surveys is that you can do branching easily and simply. You can also compile open ended respondents in easy to understand formats that are also amenable to systematic coding. yes all surveys are subject to problems. And yes the ones probing CC could likely be improved enormously as you suggest, not least by removal of CC bias from the survey instruments! But yes also they still tell us useful things, especially latterly because after ‘puzzling’ results in prior years there is an attempt to improve, with more segmentation, more distancing from identity issues, and more subtle questions to tease out real attitudes. Bear in mind that even the climate orthodox want to know what’s going on, because clearly it is not what they think should be going on. And some of the results surprise them (e.g. Kahan’s initial surprise about the increased polarization of the science aware), which strongly suggests that responses are not simply a direct reflection of biased survey instruments and are telling us real things, albeit interpretation and careful cross-checking is still needed. There are strong links between right-wing ideology and skepticism. You can take the US Congress as an example where being Republican or Democrat is about a good a predictor as you can get on attitudes to AGW. Being from a coal or oil state is another predictor. Someone should do a study of that, or is it just too obvious to even mention? Yes, per the diagram in the head post, left / right political position is a great predictor in the US, *as long as you ask the right question*. I.e. one that invokes identity defense, such as ‘do you believe in dangerous MMGW?’. The left end of the lower slope is over 80% in some surveys, so left / right stance may predict correctly as much as 4 times out of 5. Maybe higher in an identity defense intensive context. However the diagram (and the attitudes of non-partisan Americans per above, which are more evidence in support) also shows that the underlying situation has more to it than a straight reflection of position on the left-right axis. On the latter model for instance, those Dem/Libs exhibiting cultural bias, identity defense, would not be visible. Yet they outnumber by a large margin those Dem/Libs who fully believe in the narrative of dangerous MMGW. Ask these ‘shifters’ to place CC on any list of priorities, they always place low or very low. They are not committed to the narrative; they merely have a convenient alliance with it. It certainly does depend on the question. Ask whether global CO2 emissions should be controlled in some way and the majority of even Republicans say yes. That it is not a top concern may reflect that they see that there is a path to action already, and it is not just out of control. Knowing someone is a republican makes it easy to guess their position on global warming, but knowing someone believes in global warming is a better predictor that they are a democrat than skepticism is a predictor that they are republican. No. Look at the diagram in the head post. As noted, in some surveys the left end of the bottom slope is over 80%. This means that, for both Reps *and* for Dems, *for a question that invokes identity* such as ‘do you believe in dangerous MMGW?’, then about 4 times out of 5 the political allegiance of the respondents is a predictor for the answer. BUT… if the question doesn’t invoke identity issues, far less respondents express belief, and this is especially so for the Democrats. These are the ‘shifters’ in the diagram, and they never for instance place policies to fight climate change high on any list of priorities. They don’t really believe in the narrative of dangerous MMGW, they are merely allied to it. Depending upon the survey, the number of Democrats who are also true adherents of climate culture are only about 20% to 40%, not even a majority within their own party. The most certain group are the climate scientists with publications, and the Democrats are not far behind. Even ruling out naff surveys like Cook’s, I presume there’s a sizeable majority of climate scientists who are ‘certain’. But the Democrats are a long way behind. Only a minority are certain enough to back the climate change policies with their full and appropriate (to the narrative) support. The majority either disbelieve, or only claim belief for identity reasons, allegiance to party and cause, which puts them outside of ‘certain’. Interesting essay. I don’t think you are going to convince Dan Kahan, or any of the climate alarmed, the there is anything but ‘knowing disbelief’ causing the trends. You noted that many independents align themselves with conservatives on economic issues, and with liberals on social issues. The implication is that independents will tend to weigh the economic costs of CO2 mitigation more like conservatives, and so adopt ‘knowing disbelief’ to ‘defend’ their core (economic) beliefs, just like conservatives. Which is not to suggest I think Kahan is right; in fact I think his entire ‘knowing disbelief’ theory is utter rubbish, and more reflects child-like inability to imagine someone could simply evaluate the same data, and in good faith, draw very different conclusions than Kahan. This left-naiveté is something many ‘liberalsl’ like Kahan share. They struggle, in vain, to understand why everyone does not think the same way they do, and almost always conclude those who disagree with them are either dishonest (like Kahan concludes), stupid, evil, or insane. The real answer is simple: different people honestly and rationally hold different personal views and values, and those views/values enter into their analysis of most any policy issue where costs and benefits must be weighed. Liberals reject this simple explanation, because they are incapable of accepting any view other than their own could possibly have merit….. hence the contorted reasoning and the inevitable ‘dishonest, stupid, evil, or insane’ conclusion. I find Kahan’s analysis both superficial and ridiculous. When did you start referring to CAGW as “dangerous MMGW” and why? Mark, your question was posted while I typed (below) and refilled my coffee. I use both, and don’t make much distinction. But a lot of the surveys are set in terms of MMGW or dangerous MMGW, which means I fall into that usage sometimes. And phrasing it this way also seems to cause less defense reaction among the orthodox, which is no bad thing. I guess there may be some difference between catastrophic and dangerous, but considering the phraseology used by presidents and prime ministers on down, about major global disaster unless we act soon (and indeed ‘catastrophe’ by some, e.g. Gordon Brown when he was UK PM), then it seems like a rather minor and arbitrary difference. Thanks for the clarification Andy. Your designation of the “true believers” in dangerous MMGW as the orthodox is very apt. Orthodoxy can’t/won’t deal with skepticism in any venue. FTR, I am an Independent with a BSc. Lukewarmers, who say there is AGW but it will not be particularly bad, are generally regarded by the orthodox as not much different to full skeptics. This means they think it will be particularly bad. Whether particularly bad means dangerous (for the whole globe), or catastrophic, seems a bit arbitrary to me, since ‘the narrative’ tends to promote the worst cases, yet in more balanced discussion even orthodox folks often back away from the worst case. This is because cultural effects are in play. AGW and MMGW would be attribution positions where the GW is mostly or all manmade. I can’t think of anyone who is in this category who has not seen BAU warming as dangerous. Maybe Lomborg(? ), but even he makes a big deal about looking for innovative ways to mitigate, so he must be sensing that something is not right about BAU. I think humans contribute to warming, and expect some warming to be generally beneficial to humans. If you live near a coast you may have to move or sell in 50 to 100 years, depending on how close to the water you live. I also think inevitable cooling will be “worse” for humans than the projected warming (2°C?). First, good work – I am glad to see you working on this issue and I find your posts interesting. One of the interesting things about tribal affiliation is the trust in information sources. One group will trust information from, say, the HuffPost, NYT, or NPR but will not even look at Fox News, Heritage Foundation, or WSJ. It goes both ways, so the walls between groups get higher and thicker. We are bound to our biases – it is part of the human condition – but I think we can develop the vocabulary of bias so that we can have a discussion about any contentious issue. We should never fool ourselves into thinking we can identify our own biases all the time. We can, however, try to use slow thinking. Fast thinking happens all on it’s own and requires no effort from us. One group believes what they read in or about scientific journal papers, and the other doesn’t. Correctamundo! And the group that “believes what they read in or about scientific journal papers” does not include any real scientists. No true scientist would “believes” something they read in a scientific journal without considering the probabilities of error, non-replicatability, and other reasons true scientists are always skeptical. And no sane person “believes” anything they read in the MSM without a hefty dose of skepticism. AK, OK, so you take issue with the word “believe”. How about “accept as more likely true than not” given that papers come with evidence and are built on previous evidence. How about “accept as more likely true than not” given that papers come with evidence and are built on previous evidence. I suspect what you’re trying to say is that the orthodox “climate culture” accepts the supposed “consensus”, while the “skeptics” are skeptical of it. But it sill doesn’t fly. First, there’s clear evidence that the scientific process has been subverted to a political agenda since the last century. How much, and to what effect, remains a matter of debate among scientists. Second is the clear “circle the wagons” mentality among people with a small subset of policy views regardless of “outsiders'” take on the science. It doesn’t take a scientist to see that the thing is a scam. Those who understand the science can narrow the scam down to the policy debate, those who don’t are likely to dismiss the whole thing, including science, as a scam. Third, a good deal of the loudest yelling is coming from people quick to denigrate as a “denier” anybody who quotes something they don’t like even from the latest IPCC report. This stinks of the old “diabolical logic” of medieval churchmen: logic that started with biblical “truths” and led to unpalatable conclusions was simply dismissed as the “work of the devil”. And I could also add the blatant hucksterism: “4 out of 5 dentists recommend Crest.” Ya think somebody has to be a scientist to make the parallel? NCMMGW – tha sounds cool to me. The paper cited below is related to this discussion. It provides interesting some data points on world views of political independents in addition to debunking certain theories on the link between scientific literacy, political orientation and views on CAGW. Thanks. The main finding agrees with other work by Kahan (he’s one of the authors on this paper), and is that also mentioned here, i.e. that those with higher science literacy / awareness are more polarized on climate change. I’m not quite sure what it says about the Independents, because it appears to be testing a hypothesis that favoring egalitarian or heirarchical society is a predictive factor for climate change risk perception; I need to delve more. Anyhow, it isn’t considering that ‘climate culture’ may be an influence in its own right, because afaict from a quick glance the assumption appears to be that the orthodox climate change narrative is absolute fact and hence it can’t be considered as a cultural influence. I’m an independent with a science degree and while my reply to the survey would have been “generally exaggerated”, I am not a skeptic but generally agree with the consensus position. The problem is the survey is about what is said in the news – to which I would say that most of what’s in the news is exaggerated no matter what the subject is, so I question the connection between education and skepticism of GW. I would say anyone with a solid education disbelieves 80% of what is in the papers. That results in a strong connection between education and skepticism of GW. Andy West, thank you for a good post. Pingback: Weekly Climate and Energy News Roundup #192 | Watts Up With That?